Before picking up the brush, Norman Rockwell spent a great deal of time directing and composing photographs that he would use to create his iconic (and oft-derided) paintings. Instead, he first brought his ideas to life in studio sessions, staging photographs that are fully realized works of art in their own right. Selecting props and locations, choosing and directing his models, he carefully orchestrated each element of his design for the camera before beginning to paint. Meticulously composed and richly detailed, Norman Rockwell’s study photographs mirror his masterworks in a tangible parallel universe. Photography opened a door to the keenly observed authenticity that defines Norman Rockwell’s art. And for us today it is a revelation to discover that so many of his most memorable characters were, in fact, real people. Say what you will, Rockwell was a master of facial expressions. 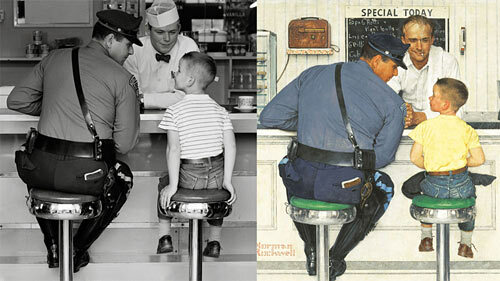 Norman Rockwell: Behind the Camera is a new book that details his creative process, and there is a companion exhibition at the Norman Rockwell Museum, in Stockbridge, Mass., through May 31st. There’s more at NPR’s The Picture Show.